I’ve always been a traditional sorta gal. I love classic colors associated with the seasons. Red and pink for Valentine’s Day, orange and brown for fall…green and red for Christmas. But sometimes it’s fun to break away from tradition and create a fresh new color palette. Like my blue and white Thanksgiving tablescape. I had so much fun finding ways for my Thanksgiving table to still say “autumn” while using the blue and white pieces I already have. Pieces curated from thrift stores and garage sales…. Adding the little details, like gilded acorns to the base of white chippy lanterns, mixes traditional elements into the tablescape. 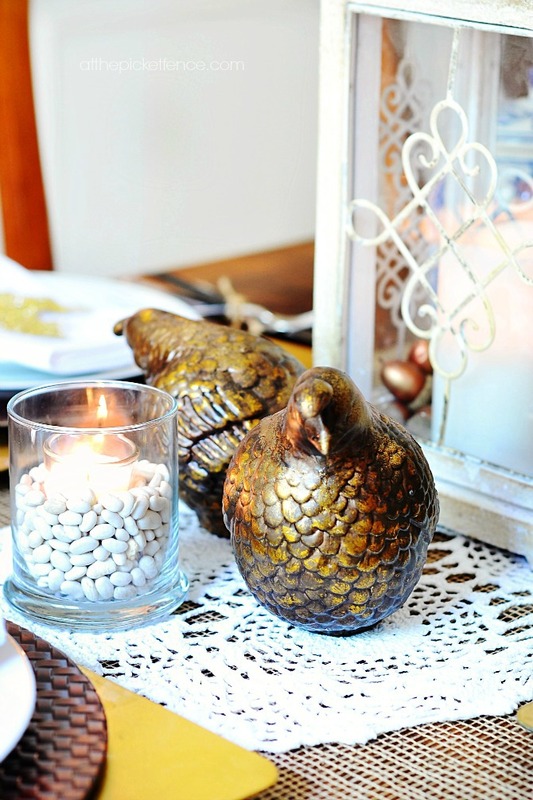 Two pairs of pretty burnished gold quails stand guard over the meal, while a white runner over created from vintage crochet pieces adds a soft touch to a piece of burlap. gold leaves ad some bling and orange mums a pop of color. 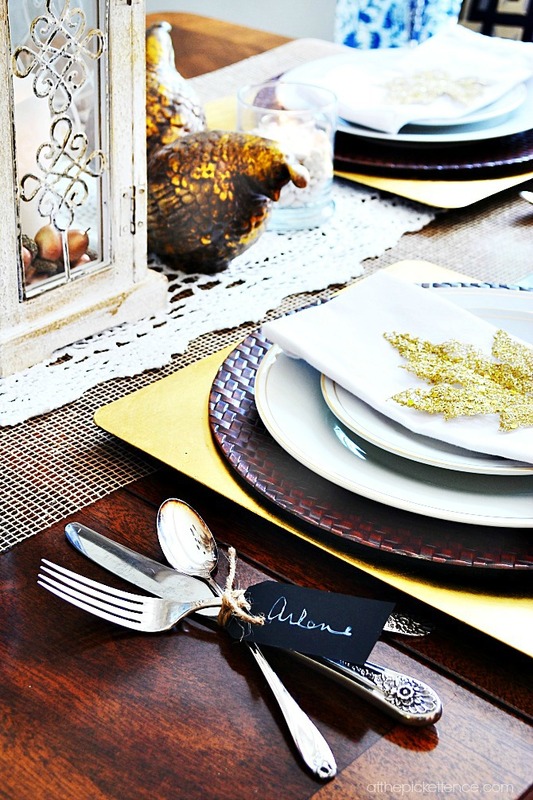 while vintage silverware tied with twine and chalkboard tags add some rustic refinement! 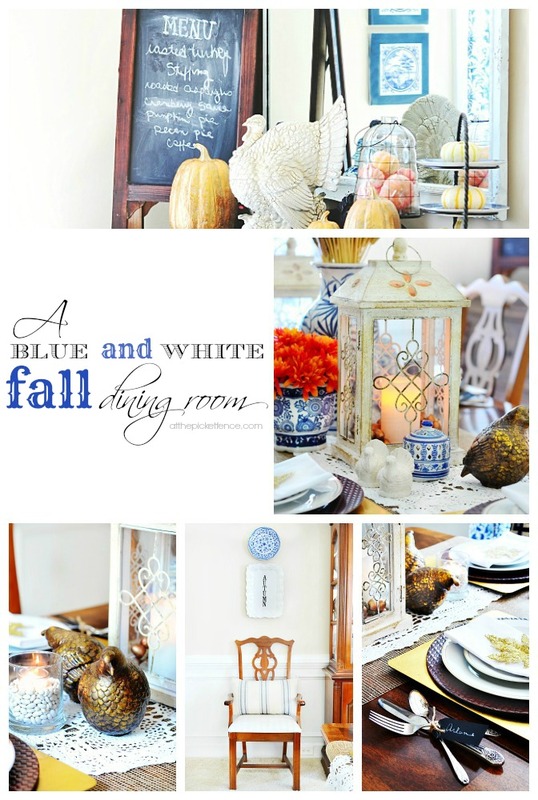 I love the bright cheerfulness of my blue and white dining room and the fact that I can still decorate seasonally with a non-traditional color palette! 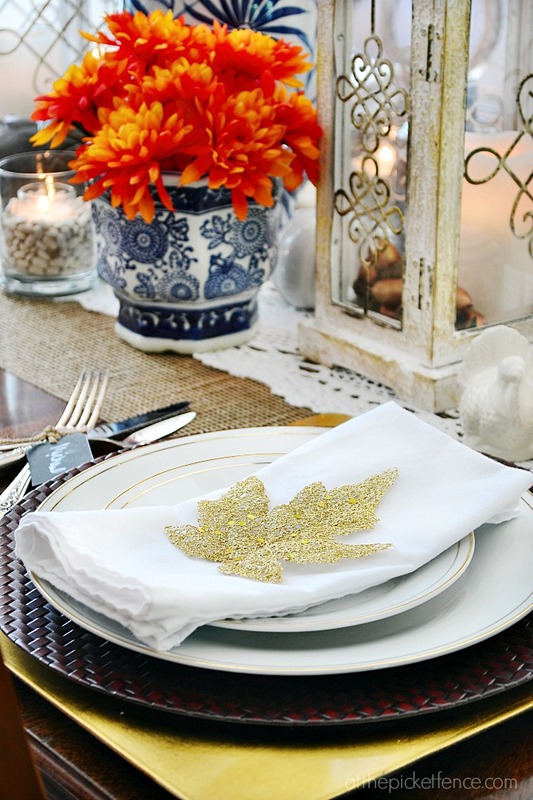 As your getting ready to host for your family and friends this Thanksgiving, think of ways you can add seasonal decor to items you use everyday for a fun new take on Thanksgiving table! I’m so honored to be joining a fabulous and talented group of ladies who are sharing their Thanksgiving tables all week long! Be sure to visit all of these amazing bloggers! For my entire dining room reveal, visit me here. 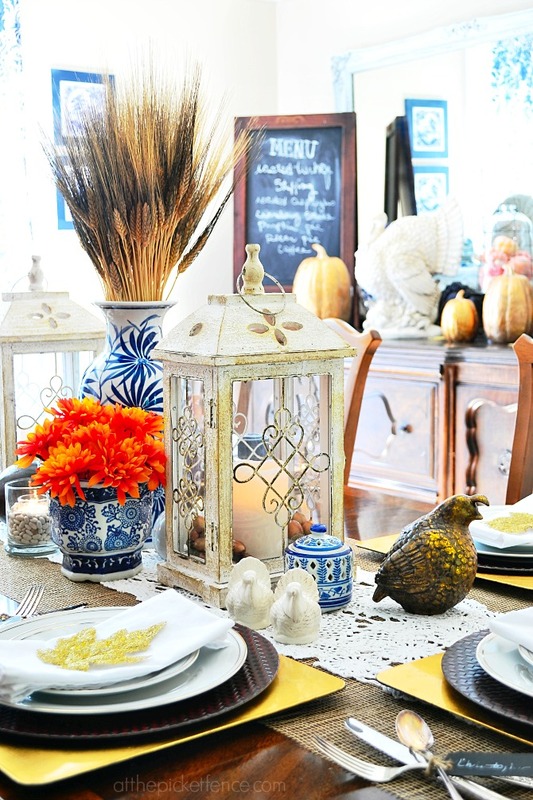 43 Comments on "A Blue, Blue, Blue Thanksgiving Tablescape!" So pretty! I have always been partial to traditional color for holidays, but slowly seeing beautiful settings like this are helping me break the mold! It’s definitely the little elements and touches that make this so perfect! Thanks for the inspiration today! your dining room is gorgeous!! playing the orange with it makes it so fallish too. i am so glad blue is staging a big comeback in decor as i have always loved it. decades ago my dining room was similar to the blues you used here and i used silver and white with it for a couple of Christmanses….aw memories. Beautiful table, Heather! I love those lanterns you’ve used. Love your table Heather. The blue looks great with the fiery orange mums. I love the blue! It’s my favorite color to decorate with, and it’s the perfect compliment to the colors of fall. I couldn’t help noticing your blue and white curtains too. So pretty! Please tell me that they’re ready made panels and that they’re still available? (They’re probably custom.) Thanks for sharing your lovely tablescape. Hi Kim! Hope you see this. They are actually from Ikea!! Very inexpensive. 🙂 I think you can order them online if you don’t have an Ikea by you. 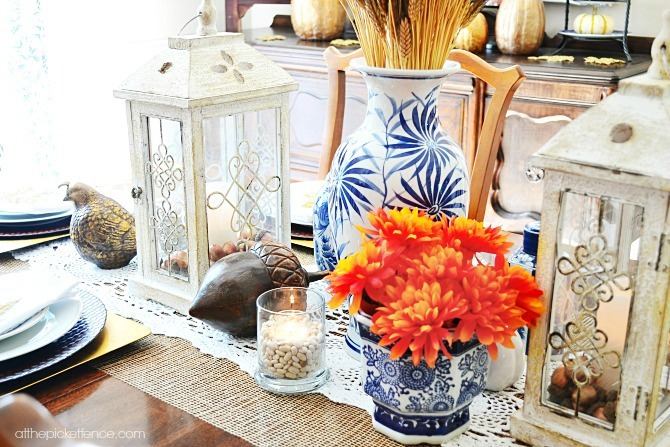 Such a magnificent table of gorgeous colors Heather…and love how you popped the orange mums into the blue vase…I am loving this series!…so many beautiful tables! 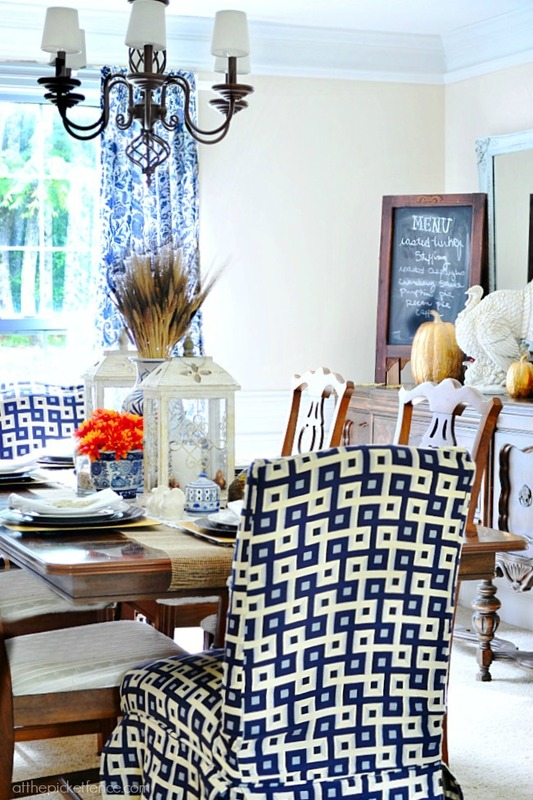 Heather, white and blue with pops of orange is really my very favorite Thanksgiving table colors! Your table is a beautiful example of how warm and welcoming and “fall” those colors can really be! I adore your dining room! What a clever idea to take your stunning silverware and tie it with twine and those precious little chalkboards! That rustic luxe combo makes me swoon! You are a traditional girl, but you have sure put a wonderful modern twist on it! Very you! Have a blessed Thanksgiving, my sweet friend! Stunning table!! Never would of thought of using blue, but it works beautifully. I’m in love with the lanterns, could you tell me where you got them? thanks, Happy Thanksgiving! I love blue and orange together and no I am not a florida gator. Will you be enjoying your first ga thanksgiving in that fabulous space this year? It looks great! So happy to be a part of this tour! Hi Heather! You table is just stunning. I like your use of the blue and white. Everything you do turns out so pretty. Hope you’re oding well. ha! you’re right Kimberly, I even have the photo labeled quail. Thanks for catching that! I debated on correcting you……sorry. Your table has got me plotting mine for Thanksgiving. Thanks again! Well I’m glad to see I’m not the only one doing blue and white for the Tablescape tour! (Mine’s tomorrow.) Like you, I enjoy veering away from the standard and expected decor. Love your table setting! Heather – Your table is just lovely. I’ve fallen in love with the use of blue and white and orange together. You did a perfect job of holding onto the traditional while giving your table a totally updated look. Your photography is pretty great too! Heather, your table is beautiful! I seriously love blue and white so this make my heart sing! 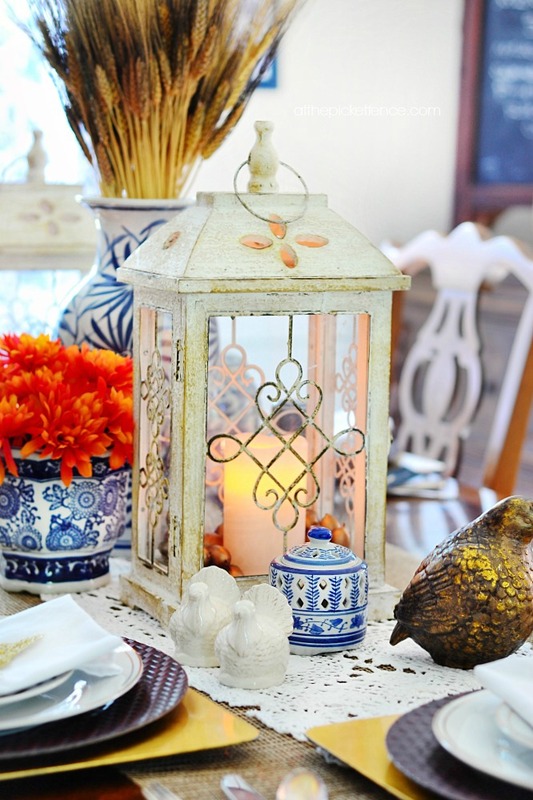 Love how you’ve decorated your dining room for the season. Happy Thanksgiving! That’s it, I’m coming over for dinner! 😉 The blue is so refreshing, like a breath of fresh air among the heaviness of November. You’re outdone yourself, it’s LOVELY! I’ve always been a fan of blue and white. I love the way you were able to blend that palette with Fall. So pretty. Also, I particularly loved your phrase “rustic refinement” when talking about the silverware. Wouldn’t that be a great name for a blog? Also, it was great seeing you at RB the other day. BEAUTIFUL Heather…LOVE that last shot!! Your blue Thanksgiving table is lovely. For some reason, blue china has always been the prettiest to me. My wedding china was even in blue. 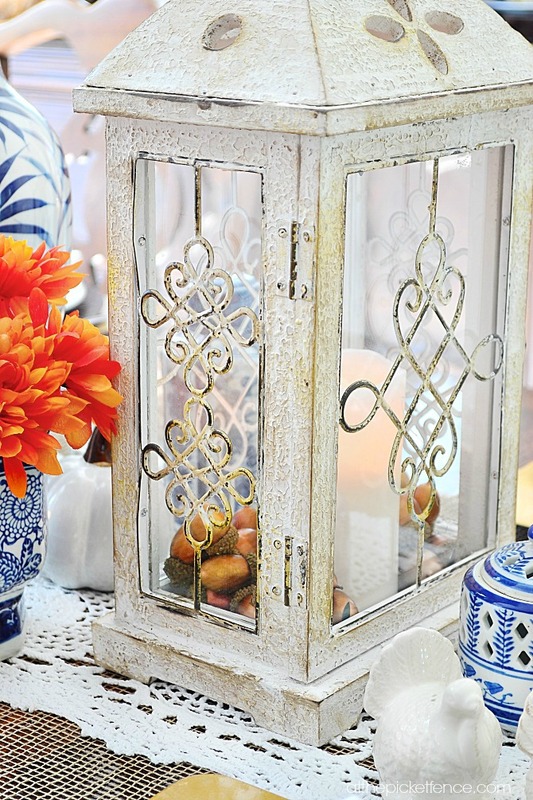 The lantern is gorgeous, and the little gold birds are sweet. You have really made a nice table for Thanksgiving. I am already getting into the Christmas spirit, as it is my favorite holiday of all. Your dining room is stunning, Heather, and the blue and white and orange woks so well with your bold patterns and your furniture. Your Thanksgiving guests will be very lucky, and I know you’ll be cooking something delicious for them. I just couldn’t dеpart your site bеfoге suggesting that I really enjoyeԁ the standard information a person supply for your guests?